KINSTON, NC - On Tuesday the Texas Rangers announced the contract purchase of former Wood Duck reliever C.D. Pelham to the 40-man roster. Upon his first appearance in a game, Pelham will make his big league debut. 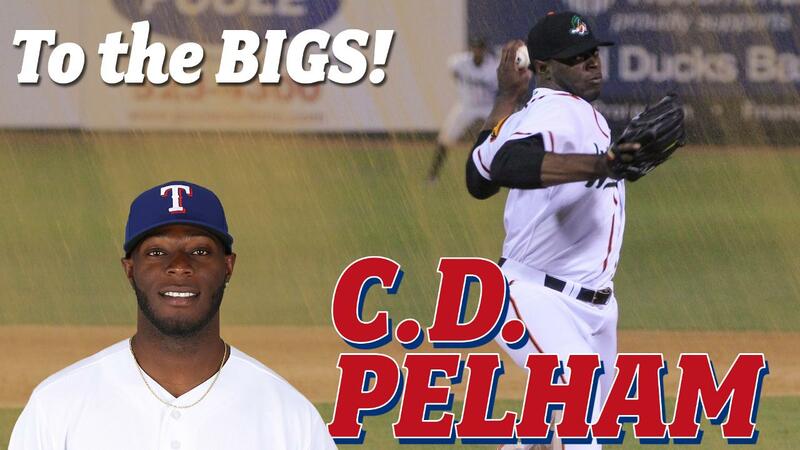 Pelham, 23, was named a Midseason All-Star for the southern division of the Carolina League. He earned the save at the All-Star Classic in Zebulon, NC and tied for the league lead for saves in the first half (11). He was promoted to the Frisco Roughriders before the start of the second half. While with the Wood Ducks he finished with a 1.95 ERA and 11.08 SO per 9IP rate. Pelham also did not allow a single earned run while pitching with the lead - a stretch of 14.6 innings pitched. The Lancaster, SC native was selected in the 33rd round of the 2015 draft out of Spartanburg Methodist College. He also previously appeared with the Wood Ducks in the 2017 postseason run, earning the save in Game 1 of the division finals against Myrtle Beach. Pelham is the third Wood Duck to make the majors in two years of existence. He will join former DEWD lefty Jeffrey Springs on the active roster and right-hander Ricky Rodriguez on the 40-man roster. Follow the Wood Ducks on social media all season long. Like us on Facebook at Down East Wood Ducks, follow us on Twitter, Instagram, and Snapchat @GoWoodDucks and stay linked at WoodDucksBaseball.com.